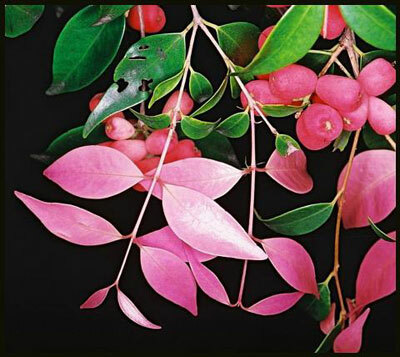 Medium tree, buttressed growing to 30m in forest or 5-10m shrub in cultivation, new growth in bright pink. Found in subtropical rainforest and along moist, scrubby watercoursesEndemic to Australia, ranging from Kempsey in NSW to Cooktown, north Queensland. Simple leaves, opposite; blade glossy, dark green above, paler below. Leaves are oval to lanceolate, rounded into base and drawn out to a blunt point at apex, 2-5 cm long. Flowers are a creamish/white, four or five petals. Flowers November to December. Fruit is a berry, pinkish/red, pear-shaped 9-12 mm in diameter. Ripe December to January. Widely cultivated as a garden plant; hardy on coast and can be grown in full sun or partial shade. Superb tub plant. A very dense tree, usually narrow in habit, but can be pruned easily to shape. Edible, the riberry fruits have a clove flavouring. The fruit can be used for making jam, and in tarts, meat sauce, and cakes. The whole fruit can be blended for use in icecream. Seedless varieties are favoured. Can be propagated easily from either seed or cuttings.